Editors Note: The following submission by Lachlan M. (’15) was the final project for his symposium, Experimentum Crucis. He and his group were studying the connections between technologies shown in science-fiction, and their real life counterparts. The taser is one of many inventions which got its inspiration from science fiction. The popular show Star Trek (1966-69) often featured phasers which were small weapons resembling hand-guns which would incapacitate those who were shot with them. 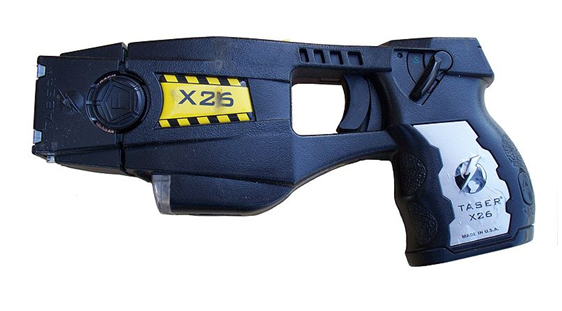 Like the phaser, the Taser is meant to stun or incapacitate. However while the phaser uses particles, the Taser stuns by using a non-lethal level of energy which causes uncontrollable contractions in the muscles. Its creator, Jack Cover created the Taser in 1976 after hearing about a man who touched an electric fence and was rendered temporarily immobile. Cover’s goal was to create a nonlethal weapon which could be used for law enforcement. His original design was considered a fire arm because it used gun powder to shoot electric darts. However, in 1993 Cover was approached by brothers Rick and Tom Smith who suggested that they should implement gas instead of gunpowder so the Taser would be available to the public. Together they formed Taser International which has grown to the point where 13,400 law enforcement agencies use them around the world as well as more than 180,000 private citizens. The Taser is an important scientific invention because it is the first nonlethal weapon to be so common. However the Taser has also started a debate in many countries around the world due to the occasionally lethal of the electricity. Since 2001 334 people have died from Taser use and this has caused some countries like Iceland to outlaw the weapon.